A teacher’s job is never finished. Even when a teacher goes home at night there is work to be done. Where a normal worker would get a break during the day, a teacher gets a prep time to prepare for the rest of the day and the future days. Being a teacher is a constant job. This important job takes commitment, time, and most importantly organization. A monthly teaching checklist is important in terms of organization for any classroom. You can find the monthly teaching checklist for your class right here! The template is free to download and can be customized any way you would like. This includes font, print, color, size, number of students and more. Next, you can download the template for free onto your computer. Once you have downloaded the template you will want to enter the names of your students along the left side of the page. 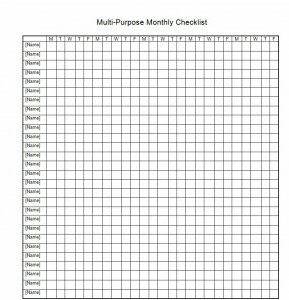 You will want to have one monthly teaching checklist for every class you have and for every list you intend to have. Organize the sheets by category in alphabetical order. Place the sheets in a notebook where you can easily get to it on a daily basis. You might also want to keep a computerized copy of each sheet but a written one allow you to see everything at once in one place. A monthly teaching checklist will change the way you teach. You will find that you have more time for other things and your stress level will go down because you will know where everything is at all times.